Tailgating before seeing your team play live is one of life’s pleasures. Tailgating before seeing your least favorite team play live (and lose) is nearly as good. Doing so wearing the colors of that team’s most hated rival is, as the Mastercard ads say, priceless! The summer party of the Costa Mesa office of my wife’s Boston-based Environmental Consulting firm, Haley & Aldrich was at a game featuring the hometown Los Angeles Angels of Anaheim (believe it or not, that is their official name) and the New York Yankees. 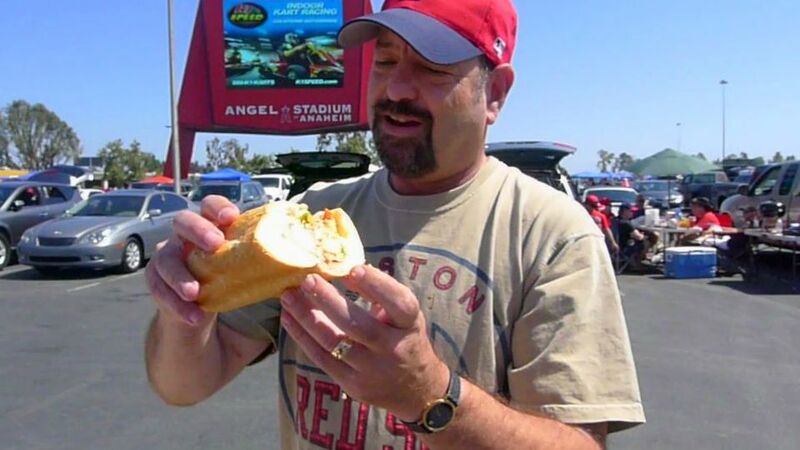 That, of course, meant wearing Boston Red Sox attire…and eating lobster. 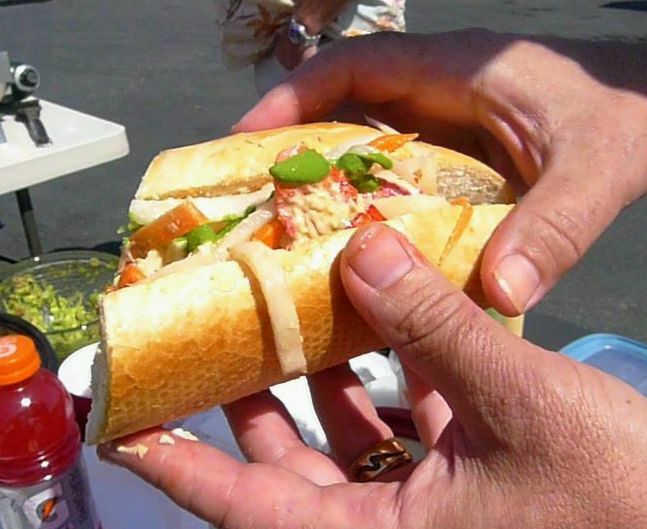 We have previously featured a New England tailgate involving lobster and bread – Lobster Rolls Aji at a New England Revolution soccer game ( http://sdfoodtravel.com/revolution-v-crew-lobster-rolls-aji/). 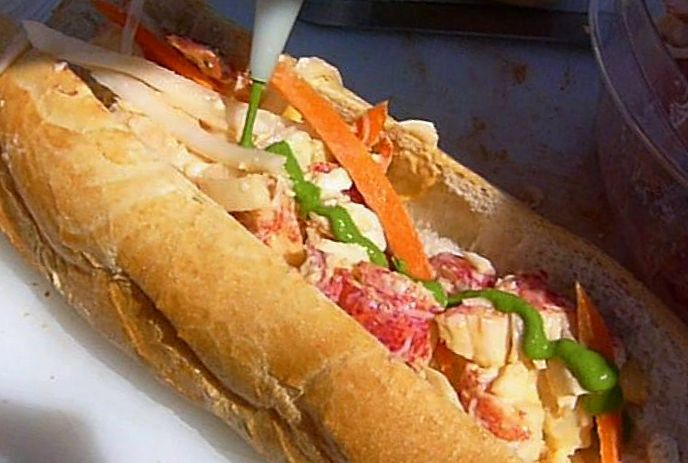 This time we crossed the classic New England lobster roll with Vietnamese Banh Mi. Of course, we’ve also previously featured Banh Mi in this space ( http://sdfoodtravel.com/recipe-citybeat-blog-pork-and-chicken-liver-pate-banh-mi/). This Lobster Banh Mi was the result. Make the Carrot and Daikon Pickle. In large pitcher or large bowl, mix water, vinegar, sugar and salt till everything is dissolved and combined well. Place carrots and daikon in a clean, sterile jar and fill vinegar till jar is full. Cover jars and set in the refrigerator to pickle for about 3 days. I like my pickles to sit for at least 3 days so that the carrots and daikon become more flavorful and sour. Pickles can last for about 3 weeks in the fridge. Cook the Lobster. Combine water and crab boil in a large pot and bring to a boil. When the water reaches a rolling boil, plunge the lobsters in, upside down and claws first. Cover the pot and boil the lobsters for 10 minutes. Remove the lobsters and allow them to cool on a cutting board (they will continue to cook in their shells from the residual, “carry over” heat). Make the Southeast Asian Mayonnaise. Meanwhile, ombine the egg, egg yolk and lime juice in the bowl of a food processor fitted with the “S” blade and process to combine. Add the oil in a slow and steady stream with the food processor running. Add the fish sauce and Sriracha sauce. Adjust the seasoning to taste. Make the Basil Paste. Fill a large sauce pan with water, add kosher salt and bring it to a boil. Plunge the bunch of basil in it and blanch for no longer than five seconds. Remove the basil and refresh it in an ice bath. When cooled, wring all of the water out of it and put it in the bowl of a food processor or, better yet, a Vitamix or other high-speed blender. Repeat with the parsley. With both the basil and the parsley in the bowl of the blender add the oil and process to a smooth paste. Add water as necessary to get the texture to a sauce-like consistency. Transfer the resulting paste to a squeeze bottle. Assemble the Bánh Mì . Slice the French baguettes in half lengthwise, brushing each half with some of the mayonnaise. Add a layer of Southeast Asian Lobster Salad and top with a line of the basil paste, cut the Bánh Mì in half, vertically, open a beverage of your choosing and enjoy the delicious prospect of watching the Yankees lose.